This free personal loan repayment calculator helps you calculate loan repayments based on different loan repayment frequency - monthly repayment, fortnightly repayment, or weekly repayment. This personal loan calculator will show the the total payment, loan interest and make your loan repayment calculation simple and easy. It also includes a loan repayment schedule / loan amortization schedule. This loan repayments calculator also can be used to calculate how long you can pay off your personal loan. In short, this personal loan calculator is very useful for your personal loan calculation although you may find other personal loan calculators available online. You can only use this personal loan payment calculator for loans up to 10 years in term (minimum loan term is 2 months). If you need to do your home loan repayment calculation, you may download the free mortgage calculator. 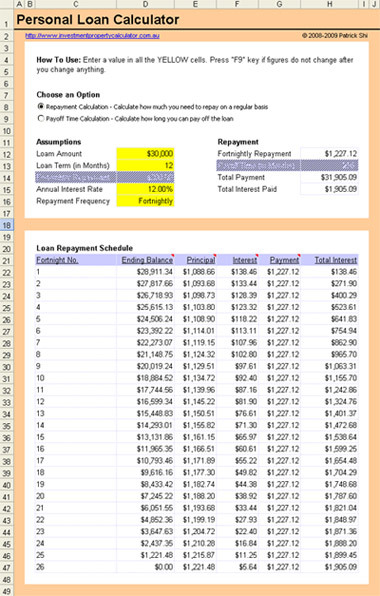 Here is a screen shot that will give you a better idea that what you need to do and what this free loan repayment calculator can tell you. This calculator is built in Microsoft Excel worksheet. You need to have Microsoft Excel 2000-2010 and Microsoft Windows to use it. You may be able to use the calculator with other applications that can open and read XLS spreadsheets, but this has not been tested. Download FREE Personal Loan Repayment Calculator!